Cracks on the slope above Interstate 82 continue to widen and spread, and rockfalls have increased, but the danger remains low. 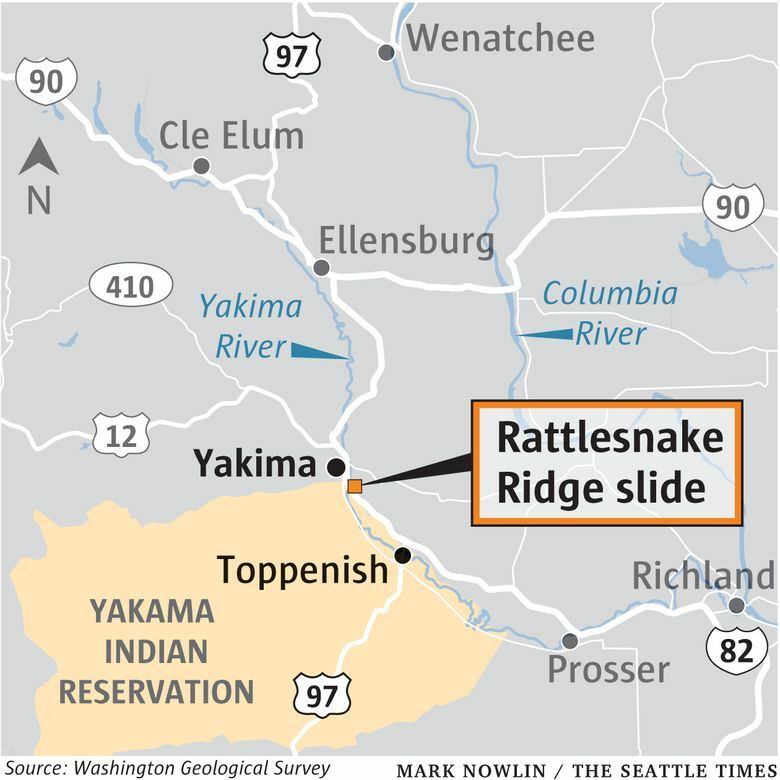 The slow-moving landslide near Yakima that spurred evacuations and a round-the-clock watch on Interstate 82 earlier this year is still on the move — but the latest monitoring suggests nature may be applying the brakes. The 4 million-cubic-yard chunk of hillside appears to have slowed its rate of descent from a peak of 1.7 feet a week in January to 1.4 feet a week in June. 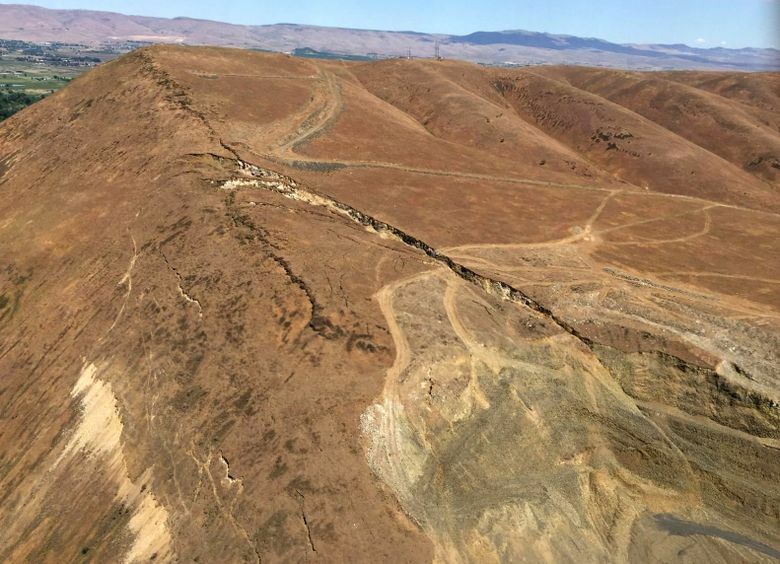 If the slowing trend continues, experts say it could mark the beginning of the end for a geologic drama that rattled residents’ nerves this winter and attracted an army of scientists eager to study a landslide in action. Since January, the slide has moved about 30 feet. A network of cracks on the hillside has grown and the rate of rockfalls onto Thorp Road, which skirts the base of the hill, has increased, said James Struthers, chief engineering geologist for the Washington State Department of Transportation (WSDOT). Seismometers continue to record about 130 tiny pops, squeaks and rumbles every hour as the slide mass creeps downhill, said University of Washington emeritus professor Steve Malone. That’s a marked reduction from earlier in the year when the rate was about 190 per hour. A full array of monitoring equipment remains in place on the hillside, which looms over I-82 and the Yakima River at Union Gap. Hammond and state officials check the data every day. But the slide no longer dominates their lives as it did in December and January, when it appeared that the 8 million-ton mass of rock and soil was poised to let loose catastrophically. WSDOT removed the flashing signs that warned motorists they were passing through a hazard zone. The agency no longer has employees keeping a constant watch on the slope. 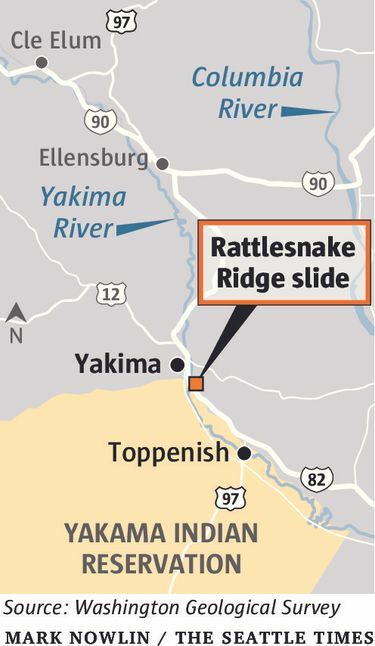 Many people who used to stomp on the accelerator when they drove past the slope don’t bother anymore, said Horace Ward, senior emergency planner for the Yakima Valley Office of Emergency Management. “It’s still daunting to me when I drive past, but it’s incredible how many people don’t notice it,” Ward said. After the county lifted an evacuation order, about half the more than 60 people who lived in a small community near the quarry returned home. Others who were uneasy about living so close to a moving landslide relocated, Ward said. Washington’s Department of Natural Resources, which is in charge of some of the monitoring, is also keeping an eye on the slide via drone-mounted cameras, said Stephen Slaughter, the agency’s landslide-hazards manager. The most likely scenario is that the slide will continue to slowly slump and slough off rocks until it builds up a buttress at the toe in the quarry, Hammond said. When the mass finally stops moving, it could fill the quarry halfway, he added. The odds that the slide will accelerate and once again raise alarms are very low, Hammond said. Since rain doesn’t appear to have any effect on the motion, about the only way that could happen is if the blocks within the slide shift in unexpected ways. While it might be unusual to monitor a slide for years, it’s not unheard of, Struthers pointed out. WSDOT has been tracking some slide-prone slopes along Highway 101 on the west side of Hood Canal for two decades.